Savings! Summer Openings! SANDY BEACHFRONT! Enjoy a Beautiful Garden View unit with direct beach access only 50 feet away! Located on a gorgeous Sandy Beach (Sugar Beach, Maalaea)! Also, it is located at the end of a quiet, non-through road! Literally lit is like your own little neighborhood paradise. There are many choices on Maui to stay but one of the best parts of being at this condo is its location… This is a serene, quiet getaway, hidden from all the hustle and bustle, yet close and convenient to sightseeing and activities. Oceanfront and Beachfront Garden View Condo unit, you are literally steps from the ocean. Watch the Sea Turtles play in the waves and feed all year, and Whales in season, right from the oceanfront. It is literally one unit from all the action, yet has the privacy you want and a garden lanai offers! And of course, Free WiFi, High Speed Internet, and Smart HD TV!! Centrally located to the airport (10-15 minutes), Lahaina/Kaanapali (15 minutes), Kihei/Wailea (10-15 minutes) and most popular activities on Maui. Costco, Walmart, Grocery Shopping are all within 10-15 minutes. This location is also a favorite spot for the whales to hang out and feed their young. It has an incredible view of neighboring Islands. Step out to snorkeling, swimming, stand up paddle boarding, beachcombing and beach strolls that go unobstructed for 5 miles, Beautiful Sugar Beach!! Quiet & private unit (555 sq ft) just steps from the beach. The unit has fresh tropical decor, a remodeled, fully equipped kitchen with granite counters, newer appliances and cupboards and a surf board bar! The Bath/Shower is European style shower with inlaid river rock floor. Travertine flooring throughout the unit. 120 square ft. lanai and a landscaped yard extend the living area. The unit has two entrances. The front condo entrance and a patio sliding door that open to the lanai are bordered by palms, magnificent Red Ginger and tropical flowers. The airy cottage decor is comfortable and uncluttered with room to relax while you watch your favorite shows on the 42' flat screen Smart HDTV. Enjoy your meals inside or outside. Bedroom has queen sized bed as well as a queen sized pull out sofa in the living room. Although the unit is considered garden view, you have a small ocean view from the lanai and it is literally one unit from direct ocean front, the pool and the BBQ grills. It's the best of both worlds; the quiet privacy of your private lanai or 25 steps to the oceanfront and crescent pool. No where else on the island will you find the loveliest of beaches in such a quiet yet convenient location! Enjoy your morning coffee next to the ocean, as you are just steps to the Beach. You will love sitting in front just watching the turtles play in the ocean waves. See whales breaching right from the property or take a whale watch boat tour to see them up close. The soothing sound of the ocean will lull you to a peaceful sleep. Maalaea Village and Maalala Harbor are within walking distance, about .4 miles down a country lane. Restaurants, Bars, General Store, and access to Whale Watch Tours, Charter Fishing, Dive, Sunset and Snorkeling Tours, all leave from the harbor near you. Don’t miss the world class and Maui Ocean Center with it's Open Reef Aquarium, and the Pacific Whale Foundation. It is easy to get around and you feel safe, a short walk from your condo. 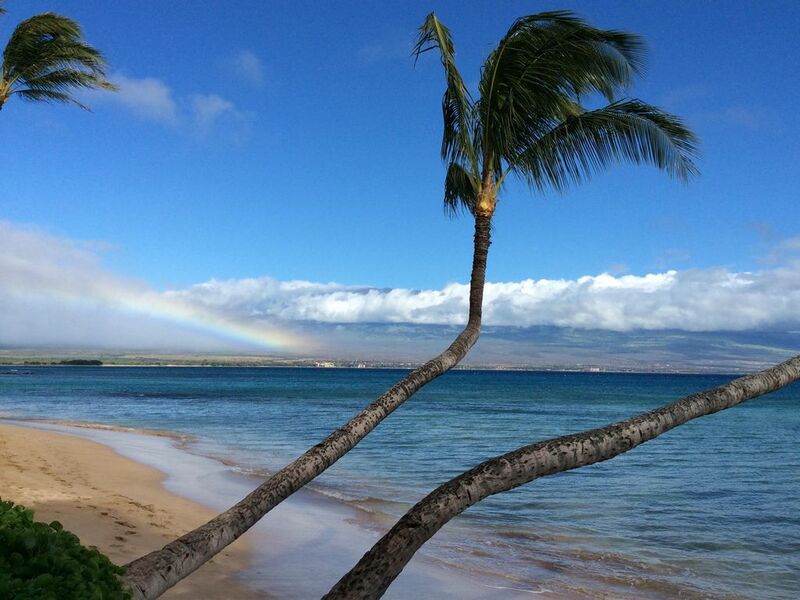 A visit to Maui should be on everyone's bucket list, you will want to return here again and again! Oceanfront and Beachfront property, steps from your door. Garden view from inside the unit, but located 50 feet away on the longest walkable sandy beach on the island. The Condominium Property is Ocean Front. There is a peek of the ocean view through the foliage from our lovely Garden View Condo. We are one unit away from direct ocean front. Oceanfront, lovely views only steps away. This unit is garden view for privacy and shade. On site coin operated laundromat across the hall. $1.25 per wash load and $1 per dryer load. Machines take quarters only. I do provide laundry pods. Cookbooks to stay with unit. Hawaiian library for all to enjoy, stays with unit. Shared novels and paperbacks in living room, please help yourself and leave something for others if you can. There is a Boss Frog's Watersport Rental store located 0.4 mi. away at the harbor, also goods for purchase. Rentals include mask/snorkle, fins, boogie boards, surfboards, and stand up paddle boards. Small bathroom, step into shower. Would need to be able to bear weight and transfer. We are the owners, living on Oahu. We have a property manager very nearby on Maui. If you need anything you can contact us, or the property manager is always more than willing to assist you while staying in our condo. Experience any part or all of Maui; If you want to walk on the beach, do everything or nothing and just relax, you will find it all and more here at Hono Kai. A visit to Maui is truly good for the soul. We hope you, too, will be filled with the Aloha spirit. The place is very clean, well appointed furnishings, everything you need in a home is provided for. We will definitely consider staying here again. I highly recommend this place. Close to the pier for snorkeling/fishing trips. Stayed at Tracey's condo in Maalaea for six days. Very nice facility, clean and well cared for. Kitchen is well organized with all basic utensils at hand. Parking is convenient and the beach is steps out the door. Will use again on a future trip to Maui. Tracy was very accommodating and friendly. The condo had easy access to the beach with some privacy on the lania. It was clean and well kept. We enjoyed walking on the beach and the marina was close by for our snorkeling tour. A little coffee/ grocery store & Beach Bums is within walking distance. We walked the sandy beach every morning, drank coffee on our patio, and enjoyed grilling at night. This is the perfect location and perfect unit! We will be back for sure! Go to sleep listening to the waves, heavenly! Tracy’s condo was such a treat and she was so accommodating! Thanks Tracy. The location so close to the ocean off our little lanai was exactly what we wanted for our Hawai’i vacation. We chose the property because my husband has mobility limitations and the first floor condo with its easy access to everything, luxurious walk-in shower and incredible access to the beach, pool and bbq area sold it for us. I LOVED going to sleep every night with all the windows open listening to the sounds of the waves crashing. Sugar Beach was wonderful for my morning walks and watching the whales put on a show right from my deck chair. The condo was well set up and the bed was so comfortable. We were sad to leave our little oasis. We thoroughly enjoyed our stay in Tracey's condo. We had an issue upon arrival - the key was not in the lock box - so I sent a message on VRBO and Tracey was at the condo within about 2 minutes to let us in. Fabulous! She's incredibly sweet and her place is very comfortable. The beach is wonderful and not crowded at all. We saw lots of whales from the beach and did the sunrise tour with Pacific Whale Foundation. Highly recommend it! The only thing I wished were different is the pedestal sink in the bathroom. There isn't anywhere convenient to set a toothbrush, make-up, hair dryer, curling iron etc while getting ready. But obviously this doesn't take away from a wonderful location and very cozy place to relax after long beach days or exploring the Road to Hana. You won't be disappointed with your stay here! Aloha and mahalo for everything!! Mahalo for the great review Linda! Whale watching (November-April) dinner and sunset cruises, diving and snorkeling tours leave from nearby Maalaea Harbor. Next to the Harbor, in quaint Maalaea village, is shopping, groceries, restaurants. also the renowned Maui Ocean Center, a world-class Hawaiian aquarium with a clear glass, walk through 'under water tunnel' allowing you to view sharks, manta rays and beautiful tropical fish. New Hump Back Whale Exhibit with reclining theatre seats new in 2019. The Maui Golf & Sports Park has entertainment for guests of all ages. It features two fun and challenging miniature golf courses, a natural 4,000 sq. ft. lagoon with water falls, bumper boats, water blaster guns, rock climbing and an X-Treme Trampoline! Maalaea Harbour, is walking distance from your condo (0.4mi). There are several restaurants including Beach Bums Sports Bar, with nightly entertainment and happy hour, (personal favorite) – Huge Breakfasts, Lobster and Prime Rib dinner every Tuesday, Mesquite Ribs to die for. Seascape Restaurant for evening entertainment and dining, and Tantes, a local style (Filipino) restaurant. Maalaea Harbour Shops offer many fine souvenir shops, ice-cream and treats, an Arts and Craft Fair, Pacific Whale Foundation Ocean Store, Hula Cookies & Ice Cream, Boss Frogs Snorkel and Dive shop (beach and ocean rentals of all kinds), and others. Schedule activities right from the Harbor for Whale watching, snorkel and sunset cruises. The General Store offers great smoothies and delicious sandwiches suitable for breakfast through supper, as well as an assortment of general store items and souvenirs. There is also a gas station, mini-mart, and a Carl's Jr for fast food. These are just some of the features in our area of Maalaea Bay. Maui has so much to offer, Helicopter Tours, Luaus, The Road to Hana, Ziplining, Hiking, Luaus, Upcountry day trips, and many of the world's best and favorite beaches .So whether you travel North, South, East, or West on the Island, you are in the center of it all. RESERVATION POLICY: Damage deposit returned 7 days following checkout if no damages occur.